After weeks of hype, it’s here. The refreshed WSVN-TV newsplex has debuted with full fanfare — though much of it isn’t really deserved. The BIG cost of Miami Newsplex redo? 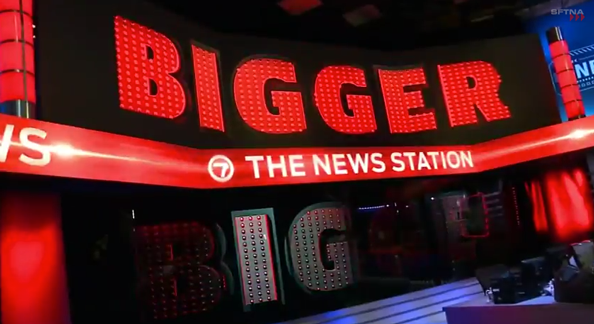 The Miami Fox affiliate has been teasing “something BIG is coming” since February and late last week we got a peek at the new newsplex set the station had built. Immediately before Sunday night’s 10 p.m. news, the station aired a remixed version of the “BIG” promo before cutting to the dramatic, heavily produced teases the station is known for. 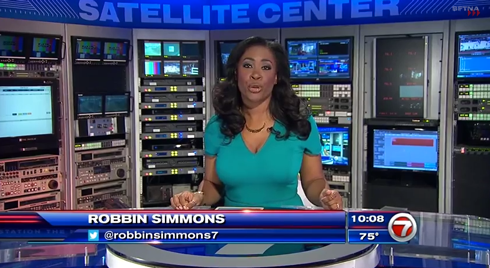 Despite all the blood pressure-raising hype, the new Miami newsplex is basically just a souped up version of the old set — with a video ribbon replacing the previous painted header, an updated video wall in place of the old one situated above the newsroom and a new, more integrated monitor wall backdrop behind the anchors. The station also added a lighted, glass platform in front of this wall to allow it to be used for standups. Since the core layout remains the same, the station still makes use of many of the same camera moves and angles, including sweeping jib shots. The changes also closely mirror the updates made to sister station WHDH-TV in Boston and, despite the changes, still suffers from visual overload and, in places, some dated looks. Speaking of dated, one little point of irony caught ours eye: That a station that says it’s the “leader” still apparently has those old-fashioned things called TAPE DECKS in its “Satellite Center,” which it used Sunday for a live report (though we’re guessing this is really just a non- or marginally-functional area that might become a dumping ground for old equipment). The cost of this little reno? Find out here.